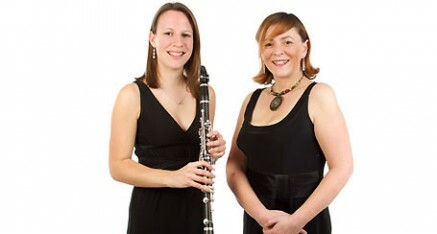 Sarah and Elspeth met in 2008 whilst performing together at Opera de Baugé in the Loire Valley, where they work annually. They also play regularly in a chamber music trio for the Olivier award winning company OperaUpClose. Recent shows include Madame Butterfly, Tosca and La Traviata at the Soho Theatre, Kings Head Theatre and tours to venues such as the Theatre Royal, Winchester and The Tobacco Factory, Bristol. Their duo recitals include a variety of music from light classics to popular favourites, and are presented in an informative and entertaining style. Sarah studied at the Royal College of Music where she won the Henri Selmer Paris Clarinet Prize and the Stephen Trier Award. She was supported by the Anne Driver trust, a Neil Vint Bursary and won a Philharmonia Orchestra Martin Musical Scholarship. She has worked with The LPO, The English Chamber Orchestra, Royal Ballet, KZN Philharmonic (South Africa), Brit Award winner Duffy and has played on BBC Radio 3 and Radio 1’s Live Lounge. She is a founder member of 11 Collective and Session Solutions who provide live instrumentalists and virtual tracks for bands and composers. Elspeth studied at King’s College, London, Trinity College of Music and the Royal Academy of Music. She has worked with BBC Wales, Royal Ballet and Royal Shakespeare Company. As musical director/chorus master/repetiteur, Elspeth has worked with Co-Opera Company, Northern Island Opera, Riverside Opera, Tete a Tete Opera, New Devon Opera, Longborough Festival and Chelmsford Opera. Elspeth was accompanist for Lesley Garrett and Friends and works as accompanist/assistant conductor with Barnes Choir, London Oriana Choir and Thurrock Choral Society.